CAPACOA - What is Presenting? In hundreds of communities across Canada, people and organizations are devoting their skills at bringing together touring artists and audiences. These presenters may work within non-profit organizations, municipalities, universities, schools or festivals, but they all share a common passion: supporting artists, developing audiences and building community. Presenters are an essential part of the creative chain. 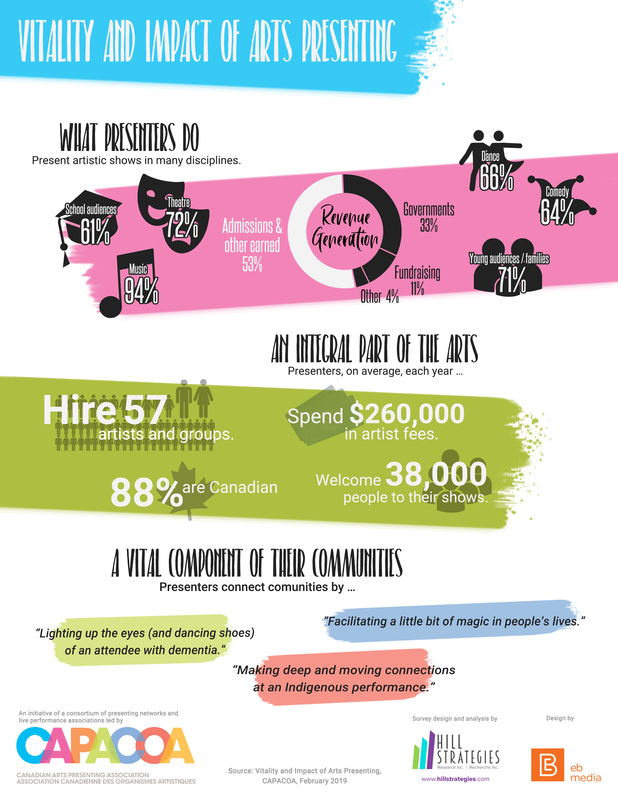 Presenters create access to live performing arts for all Canadians. Arts presenters select the artistic programming for public presentation in their community based on an artistic vision. They purchase performances and other artistic activities created by professional artists, groups and companies; and they are responsible for paying a guaranteed fee to the producer for each presentation. They provide the venue and supply the technical and promotional support. Presenters may also organize audience development and/or outreach in support of their artistic programming. They have a thorough knowledge of the audiences in their communities, of the professional arts community and of the various networks that support both the artists and the presenters. The CHRC's Presenters Competency Chart and Profile also provides a detailed overview of the large array of skills inherent to presenting. Presenting is also enabled by services organizations often referred to as "network". There are more than 30 presenting networks in Canada. Presenting Support Networks are national in scope or regionally-based and typically serve non-profit presenters as well as municipal presenters, festivals and university presenters and other stakeholders. Other presenting support networks are specialized in one type of presenting activity and may serve festivals or presenters specialized in disciplines, such as dance or theatre. Presenting networks provide presenters with a marketplace to do business, and with professional development opportunities and tools. They also offer specialized services such as block booking, which increases the cost-efficiency of touring activities, thereby enabling presenters to deliver more benefits to more communities. Learn more about presenting in our Field Information page.